1) Mills Park- with covered shelter and grills- on the lake between Lakeside Marina and the state boat ramp. 2) Mandeville Park and ball field- across from Lakeside Marin playground equipment-used without charge. Also frisbee golf is located here. 4) Fredrickson Park-comer of Elm St. and Lakeview Lane- picnic tables, grill, playground equipment and basketball court. 1) the end of Ash St.
3) the end of Birch St.
4) the end of Cedar St.
6) Public space behind Cobblestone buildings large grassy area with dock, sandy beach, and great rocked shore for fishing. 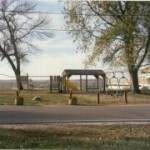 The Lakeside Marina and Campground is also located here. Please call for reservations (712) 732-7465.